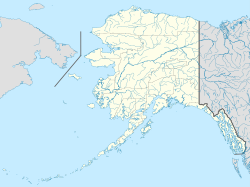 Akun Island (Aleut: Akungan) is one of the Fox Islands subgroup of the Aleutian Islands in the Aleutians East Borough of southwestern Alaska. The island lies east of Akutan Island and southwest of Unimak Island, across the Unimak Pass strait. The Krenitzin Islands lie to the south and southeast, across the Avatanak Strait. Akun Island has a land area of 64.39 sq mi (166.77 km²). It is 22.57 kilometres (14.02 mi) long, 18.2 kilometres (11.3 mi) wide. It is unpopulated, except for airport workers and a few people controlling the cattle. Akun Island is home to a small but significant population of cows. They are no longer domesticated but the population is controlled. Three domesticated horses also inhabit the island. With the cessation of amphibious airplane service to Akutan on Akutan Island, the Akutan Seaplane Base closed in 2012. It was replaced by a new $75.5m land-based airstrip 6 miles across the water on Akun Island, named Akutan Airport. It was built by Kiewit, R&M Consultants, and DOT. The airport was connected to Akutan by an expensive hovercraft shuttle, which couldn't operate safely when winds were too strong or waves too high. Operating costs were very high. Currently, a helicopter provides the link between Akun and Akutan. The airport has a small hotel, which is used when a flight arrives but the hovercraft is unable to run. ^ Alaska Dispatch News: "Air service to Akutan ends despite new $75.5m million airport", by Mike Dunham, 4 November 2012. This page was last edited on 11 October 2018, at 06:54 (UTC).